Think about how He came to Earth. For centuries, Israel had waited for a political Messiah. They expected Him to lead a rebellion and free Israel from Roman oppression. But how did the Messiah make His entrance? He came in a way that made it easy for His own people to reject Him. He came as a frail baby, born in a feeding room for animals. There He was. The promised Messiah who was expected to overthrow the Roman Empire and set Israel free from oppression. A needy Nazarene born in a manger. When Jesus grew up, He ate and drank in their presence and taught in their streets (Luke 13:26). Yet they didn’t recognize Him. He was unassumingly modest. A mere craftsman; the son of a craftsman. He grew up in the despised city of Nazareth, fraternizing with the despised and oppressed. But more startling, He befriended sinners (Luke 7:34). As such, the people of God didn’t recognize Him. Why? Because He came in a way that made it easy for them to reject Him. And what about the disciples? Read the story again. Jesus continued to break out of their expectations. He couldn’t be pinned down, figured out or boxed in. The Twelve were constantly confounded by Him. His teachings were offensive. His actions scandalous. His reactions baffling. But the greatest offense of all was the cross. It offended everyone—both Jew and Gentile. The only crown the promised Messiah-King would accept was a crown of thorns. Look at Him again. A suffering Messiah, a defeated King. It’s easy to reject Him. One of the Lord’s most faithful disciples teaches us this principle well. Mary Magdalene was the first person to see Jesus after His death and resurrection. Do you remember what she did as soon as she recognized Him? She grabbed Him, and she wouldn’t stop clinging to Him. Jesus responded, “Stop clinging to me” (see John 20:17, Greek text). Why did Jesus tell Mary to stop clinging to Him? Because Jesus had somewhere to go. He was on the move. Jesus was poised to go to Galilee to see the other disciples and then to ascend to His Father. Note the principle: He was moving forward, but she was clinging to Him. Jesus was in effect saying to her: “Mary, stop holding on to me. There’s a new way to know me that’s different from what you’ve experienced thus far. Let me go. I must move on.” Do you remember the disciples who walked on the road to Emmaus? Their hopes were shattered by Jesus’ horrible death. Suddenly, the resurrected Christ began walking beside them, yet their eyes were blinded from recognizing Him. However, when He engaged in the very simple gesture of breaking bread (something He had done frequently before them), their eyes were opened. He then quickly disappeared from their sight. These stories hold a critical insight. You cannot cling to the Christ you know today. He will vanish from your midst. Jesus Christ is an elusive Lover. Seeking Him is a progressive engagement that never ends. He doesn’t dance to our music. He doesn’t sing to our tune. Perhaps He will in the beginning when He woos us, but that season will eventually end. Just when you think you’ve laid hold of Him, He will slip out of your grasp. He will appear to you as a stranger. But on second glance, we’ll discover He’s no stranger at all. Emmaus will be repeated. We all wish to cling to the Lord who we know now. We all wish to hold on to the Christ who has been revealed to us today. But mark my words: He will come to us in a way we do not expect—through people we’re prone to ignore and inclined to write off. Perhaps they don’t talk our religious language. Perhaps they aren’t theologically sophisticated. Perhaps they don’t use our vocabulary. Perhaps they don’t share our insider knowledge nor parrot our religious idioms. So we cling fast to the Lord we recognize—receiving only those who talk our language, use our jargon and employ our catchphrases—and all along we end up turning the Lord Jesus Christ away. What, then, does Jesus do after we fail to receive Him when He comes to us in an unexpected way? He moves on. And the revelation we have of Him ceases to grow. Jesus Christ is richer, larger and more glorious than any of us could ever imagine. And He comes to us in ways that make it tempting to reject Him. When Peter, James and John saw the transfigured Lord on the holy mountain, Peter wanted to build a tabernacle for Jesus, Moses and Elijah and remain on the mountain to enjoy the encounter. But God would not allow it (Matthew 17:1-13). There is something in our fallen nature that, like Peter, wishes to build a monument around a spiritual encounter with God and remain there. But the Lord will not have it. He will always break free from our frail attempts to pin Him down, box Him up and hold Him in place. And He does so by coming to us in new and unexpected ways. The purpose of the Bible is for you to come to know God – the Author of the Word. All other books are read so that you can come to know more information and when you are finished reading it you will not know the author as that is not why you were reading it. But, the Bible is read so that you can come to know the Author and not just more information. Information is not as important as experiencing and coming to know God through His Word and then being transformed. 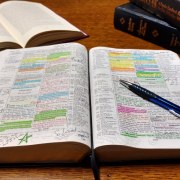 2 Timothy 3:16-17 states that “All Scripture is given by God so that the people of God may be complete and equipped.” This means that the Scriptures were given so that we can come to know God and become like Him (“complete”) and able to do what Jesus did (equipped). This is the purpose of the Bible. It helps you to know God, become like God, so that you can do what Jesus (God in human flesh) did. So, are you reading the Bible on a regular basis? Are you reading it for the right reason and with the right motive? Are you being transformed by what you are reading? Are you learning and growing becoming more skilled in doing the supernatural work of the Lord and thus fulfilling the call of God on His people and on the Church? If not, then you are simply like the Pharisees in the time of Jesus who really did not “know the Scriptures nor the power of God” (Matthew 22:29) in spite of all their memorization, knowledge, and information gathering from God’s Word. So, as we approach the end of another year and the start of 2013 it might just be time to take a look at your Bible reading or the lack of it. And, make a quality decision to do better and to actually use the Bible for the reasons it was written and for nothing else. Let’s decide to come to know the Author better than ever before – to become like Him (“complete”) and to do what Jesus did (“equipped”) as we are His Body on the earth today. Good Friday has come and for most people in my neighbourhood it is simply a day off and a great excuse for a long weekend. In fact, as I write this, it is Good Friday morning and “not a creature is stirring, not even a mouse” (Whoopse – wrong holiday). Good Friday is God’s Friday for it was totally within His perfect will that His Son Jesus die on the Cross of Calvary on a garbage dump outside of the city of Jerusalem. It was and is God’s way to re-establish fellowship with His creation – humankind. Fellowship with us is impossible because our sin separates us from our Father Creator (Isaiah 59:1-2). So, Jesus made a way (He is The Way) for humankind to once again have fellowship by taking our penalty upon Himself – He died so we would not have to. And, by the shedding of His blood, we can now receive forgiveness and have this precious gift of eternal life which is a relationship with God the Father and His Son Jesus empowered and enabled by the Holy Spirit (John 17:3). All because of Good Friday – which is more than another day off or part of an April long weekend. We could say that Good Friday is the day that death died. Death was born in the Garden of Eden when the (first) Adam disobeyed the Lord and did what he had been told he must not do. He disobeyed the Word of the Lord and took all of mankind into spiritual darkness. This day death was born and allowed to roam free upon the face of the planet we call Earth. On God’s Friday Jesus died on the Cross and then, on the first Easter Sunday, rose bodily from the dead and is alive even today. He defeated death. He is the “Second Adam”. Easter is the day that death died. In other words – Easter Sunday is the day that death died after holding people in the grip of fear about death and life-after-death for thousands of years. It is no longer our enemy as death has died and we now have the wonderful gift of abundant life now and life forever into an endless eternity . There is apparently a lack of hope in North America today. It should be expected due to the economic downturn and the rising unemployment rates in both Canada and the United States – and all over the world for that matter. However, statistics are not in for the last six months as of yet. So we don’t yet know what this worldwide economic downturn and “disaster” is doing in this whole area of hope for the future. However, even without taking the current economic situation into account the statistics show that we are a generation that has increasing less and less hope. There is a lack of hope. In fact, there has been a 5% increase in the U.S. suicide rate since 1999 and a 16% increase in the U.S. suicide rate among those ages 40 to 64. This, of course, is just the tip of the iceberg as many suicidal deaths do not get officially recorded as “suicide” and many others attempt to commit suicide, fail and thus live. The statistics for those suffering from various forms of depression are, well, depressing. We have been born again into a living hope! The living hope is eternal life – a relationship with God now and forever into an endless eternity. This gives the believer, who is now a ‘new creature in Christ’ a new perspective – God’s perspective – on daily life. The believer now has a “bigger picture” and so can see daily events and happenings in light of eternity. This always brings hope as we see that there is a light at the end of the tunnel and it is not a fast moving train. This “living hope” gives us CONFIDENT OPTIMISM. Let’s look at what we received when we were born again into this living hope. But He has been raised from the dead and so we can live in a living, eternal hope of our own resurrection from the dead and a life with Him forever. 1 Thessalonians 5:8 But since we belong to the day, let us be self-controlled, putting on faith and love as a breastplate, and the hope of salvation as a helmet. My prayer is that today you will do just that – walk in hope and tell others why you do. We feel honored to serve such a Leader who loves us.